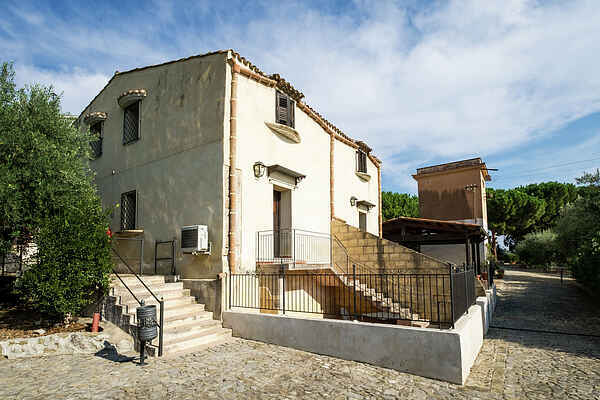 Charming country estate of the nineteenth century, facing the sea, ideal for exploring the western part of Sicily. Immersed in a lush citrus groves, just 15 km from Palermo and 45 km from Cefalu. The property consists in a main body with an internal courtyard which gives access to the restaurant with typical sicilian cuisine with an innovative twist where you can enjoy excellent meals for breakfast and dinner, prepared with ingredients fresh from the plantations of the structure topped with organic extra virgin olive oil and wine. The garden has a swimming pool which gives direct access to 6 apartments and 11 bedrooms in country style with great attention to comfort. The apartment (33 mq) has a living room with sofabed for 1 person on the ground floor and a kitchen corner, on the first floor there is a double bedroom with a bathroom. It has a private open space which is furnished and a nice view towards the trees. The apartment (33 mq) has a living room a kitchen on the ground floor and a bedroom with a matrimonial bed and a bathroom on the first floor. It has a private open space which is furnished and has a nice view towards the trees. We rent out bycicles for those who care to explore the surroundings or to go to the beach. Also you can participate in the cookinglessons organised in the restaurant or go out for a fishing trip organised by the staff of the Villa.